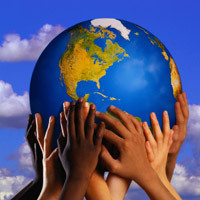 As a global community, we are immersed in a profound and transformative period in history. 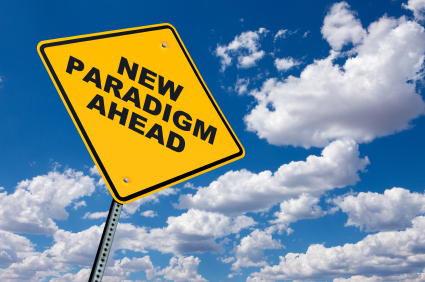 How can schools play a positive role in this significant shift? Although technology provides us with unprecedented connectivity and access to information, the fundamental skills required to be successful, both socially and in the workplace, are increasingly ambitious. This leaves educators in a complex quandary. While we grapple with the details about best practice and how to integrate digital literacy and technology into existing curriculum, our students continue to use technology in more and more areas of their lives. They also seem to have a minimal learning curve and quickly acquire the skills to navigate new technology. Seem is a critical word here. We must consider how our students are using technology and the impact of this use in their lives and the world around them. The digital world that we find ourselves in is fast paced and ever changing. How long can we wait to support our youth to make the adjustment positive and meaningful? I believe we cannot wait another day. Canadian youth are highly connected to digital media. This connection is often outside of school and largely unsupervised. Media Smarts is a Canadian organization for digital and media literacy (http://mediasmarts.ca/). Their vision is “that children and youth have the critical thinking skills to engage with media as active and informed digital citizens. 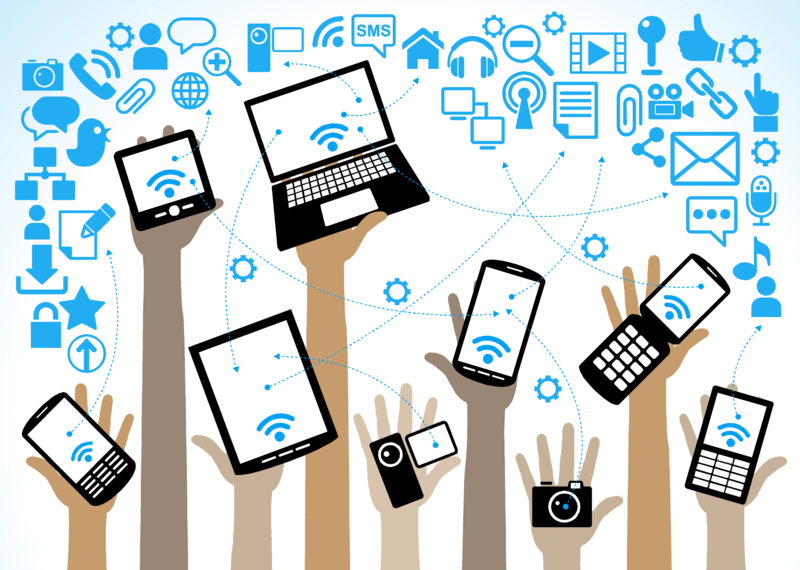 The results of a national study indicate that the majority of our youth have access to the Internet through personal and portable devices. Top websites include Google, Twitter and Facebook. The most frequent activities include streaming music, social media and playing online games (Media Smarts, 2014). We certainly have a generation of technology consumers. I often encounter educators who are concerned about how they will ever catch up to the ‘digital natives’ or ‘technologically savvy’ students that they are supposed to teach. Another common reason for resisting technology in their practice is the belief that students get enough technology outside of school. As I reviewed the results of the Media Smarts survey I began to wonder, at what point did we decide mass consumerism indicates a high level of skill or thorough understanding worthy of a title such as digital native or tech savvy? The vast majority of today’s students are comfortable with technology and they are using it. This is something we know. It remains unclear how well they are using it and what potential is lost when educators fail to realize the powerful role they can play. The Information and Communications Technology Council and MediaSmarts facilitated a one-day Symposium to discuss digital literacy and the critical issues facing Canadian Youth (2014). Participants included students, teachers, researchers, policymakers and other representatives interested in promoting a digitally literate population that can compete in a growing global economy. Although responsibility for supporting essential digital literacy and skills does not land solely on educators, participants agreed that schools play a significant role. This does not imply that teachers must become experts in using the plethora of digital devices now available. The teachers role is much more significant and varies little from the description of an exceptional educator who makes learning accessible, relevant and engaging for each individual student. Educators can support digital literacy as a facilitator, activator and motivator to move learning forward in a meaningful way. I believe that making this shift in our classrooms will help to move students from simply users of technology to producers who know how to learn and can use their understanding to create, collaborate and communicate in new and profound ways that will have a positive impact for them and their global community. 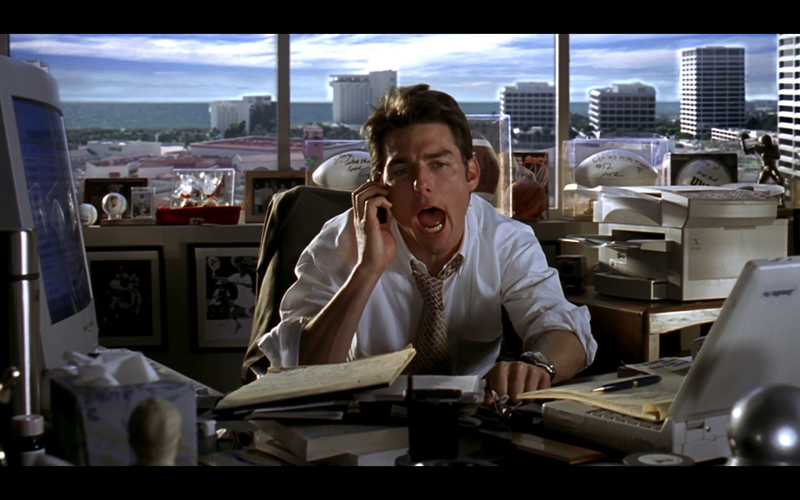 I always dread report card season. I do not find it to be a terribly difficult task, actually after eight years of teaching the same grade it has become quite easy. 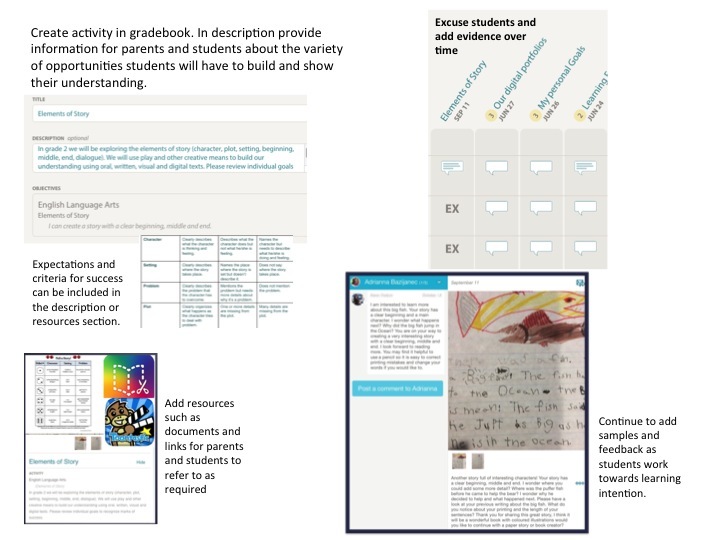 The issue for me, as I am sure it is for many teachers, is how to summarize the progress, highlight strengths and make meaningful suggestions for future learning for each of my unique students in one small box? 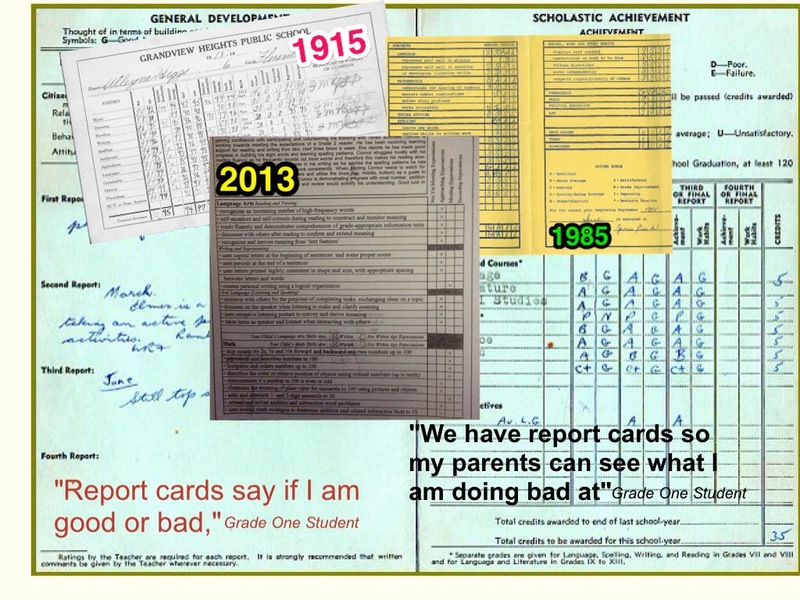 Do parents actually read the report card and have a discussion with their child? 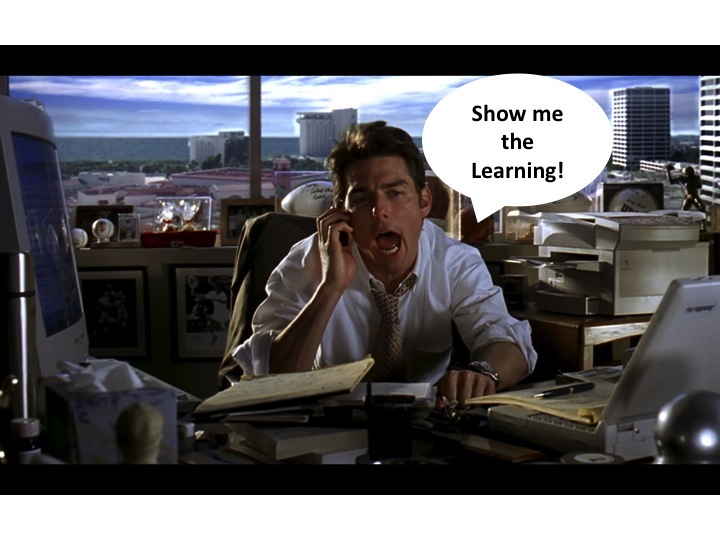 Do parents or students feel informed in a way that would benefit future learning? I honestly do not know but I have never been satisfied with the current reporting system as a parent or a teacher. This year when my children brought home their report cards for their first term in grade two and one respectively I realized how much our current reporting system falls short. Although my son has always been a very bright and curious boy, school has never been on the top of his favourite activities. 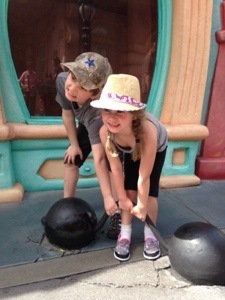 He would much prefer to be fishing or exploring the world around him, as is the case for many boys. Learning to read was a struggle for him and although he made a good effort it would take two years of LST support and getting eye glasses before he was reading at grade level. 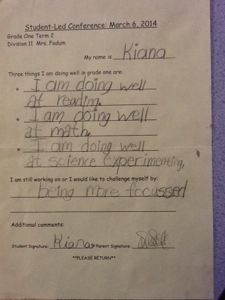 The first few months of grade two he worked incredibly hard and we saw wonderful progress. My daughter on the other hand has always been incredibly studious and like many girls loves to learn. 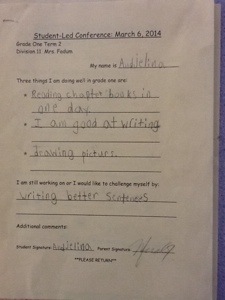 She started her first term in grade one reading and writing well above grade level expectations. 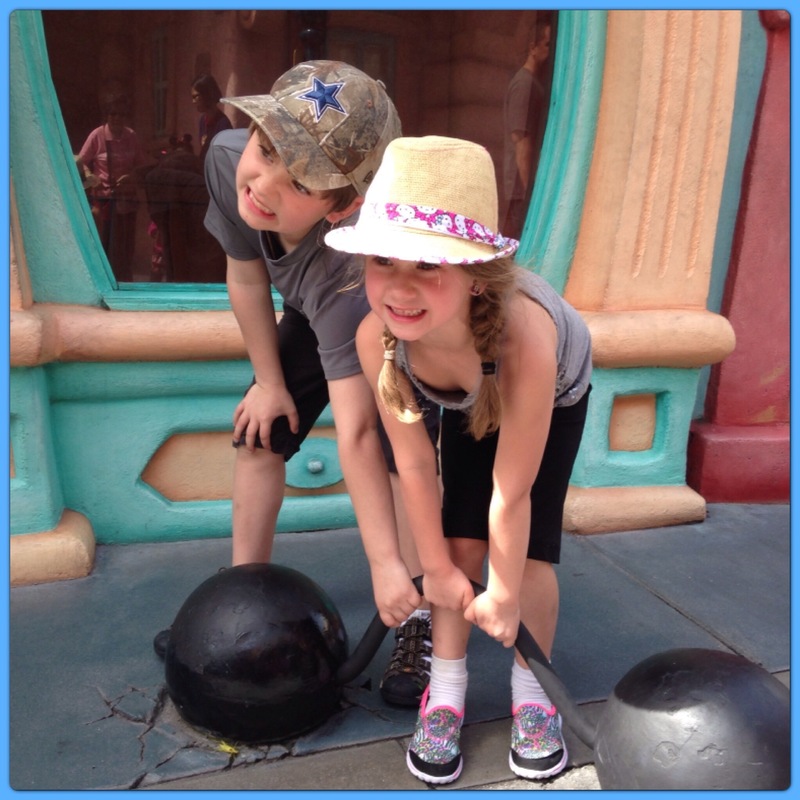 Before opening their term one report cards I asked my kids about what they learned. 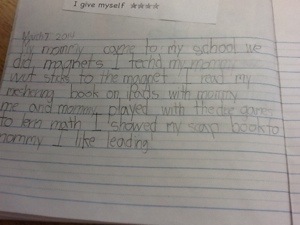 My son was able to talk about reaching new reading levels and learning to read and spell new words. He was quite proud of his progress and rightly so. This changed after we opened the report cards. After comparing all the ‘approaching expectations’ boxes checked on his report to the many ‘exceeding expectations’ checked on his sisters he was very frustrated. Although I read the comments highlighting his progress he was left with the impression that he did bad and his sister did great. The reality is that my daughter really did not learn anything. This is not a reflection on her teacher but the reality that she entered grade one already meeting the prescribed learning outcomes. My son learned a great deal and made excellent progress yet this was not reflected in the report card. Again this is not about his school or his teacher rather it is, in my opinion, the result of an inadequate reporting system. 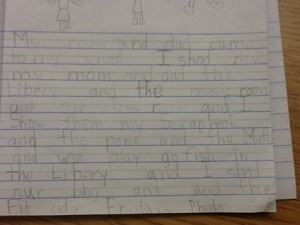 This is the reason I decided to take on the opportunity to formally report in a different way in my own classroom. 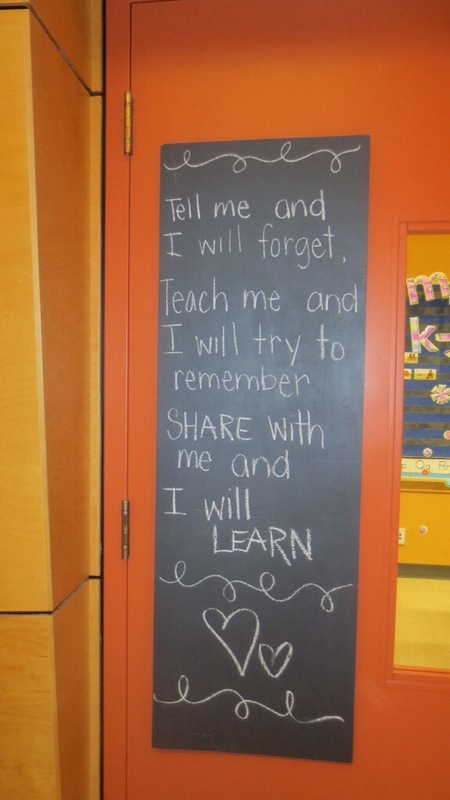 I teach grade one at Pacific Heights Elementary in Surrey, BC. I am privileged to be part of a forward thinking school district and thankful for the freedom to explore a new approach to connecting with and informing parents. As my first attempt I decided to host a student led conference during the school day and I am thrilled with how successful it was. 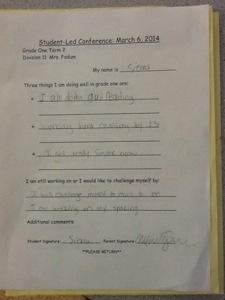 Although student-led conferences are not new this was my first experience facilitating them during the school day and using the experience as a means to report student progress. 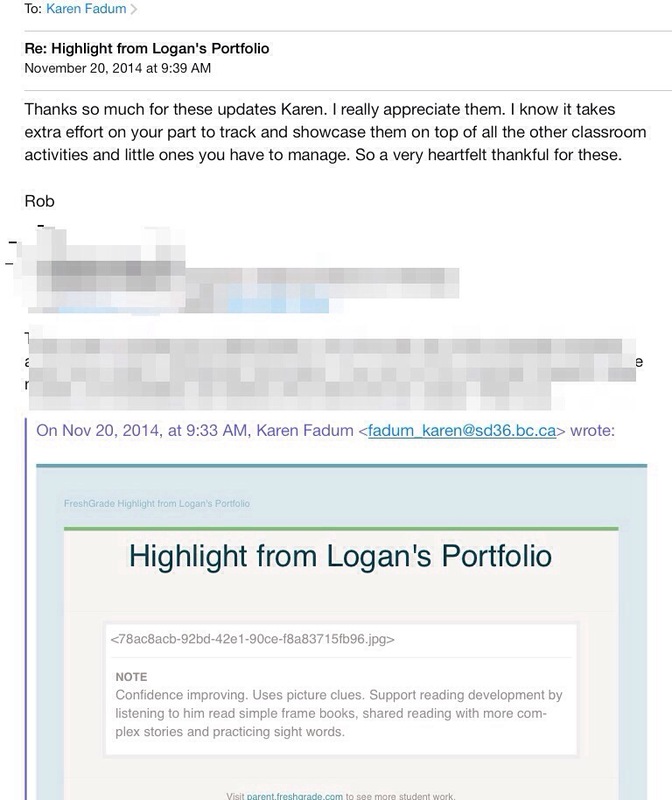 The first step for me was to let my parents know that I was interested in sharing their child’s learning with them in a new way. I had no idea if parents could or would commit to spending 30-45 minutes of their day in our classroom. I had a discussion with my class and they all agreed that bringing their parents to our classroom was a great way to share our learning. I drafted a letter and sent it home. The next day 15/21 students returned the notice with a commitment from their parents. It was amazing to see how excited the students were to return this notice to me. Within three days of sending the notice home I had a commitment from all of my parents. The kids were absolutely thrilled! The last notice I received was from an ESL student who shared with me that her parents were nervous to come as they did not speak English. I talked with the student and her older sister and explained the concept of students leading the conversations. I was very touched by the enormous smile on her face when both of her parents, who had never been to our classroom, showed up for the conference. Parents were invited to come to our classroom in the morning, after recess or after lunch. It was nice to know in advance when to expect parents so students could be prepared. I booked our school iPads for the day and organized my students for a day of independent work with our literacy and math centres. I really wanted to give parents a glimpse into grade one and make this a very natural meeting. With the class functioning as per usual when they arrived, parents could also see how their child works in a class setting. For me a few moments watching their child move about the room or work at a table is much more meaningful than one sentence about work habits on a report card. When a child’s parent arrived at the door they would stop what they were working on, greet their parents and take them on a QR code scavenger hunt visiting five stations throughout the school with their iPad. I decided to use QR codes and iPads to make it more fun and highlight some of the students skills using technology. 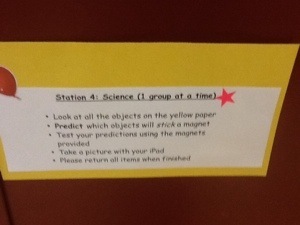 Some of the stations asked students to share projects on their iPads or take pictures of completed tasks. 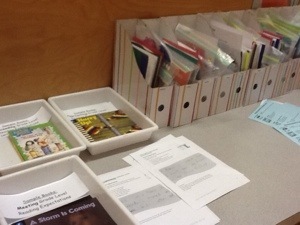 I had five stations set up: science, math, language arts, physical activity and student choice. 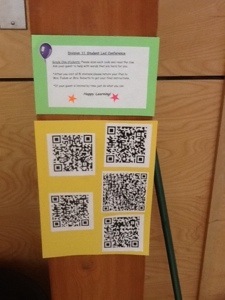 Students randomly scanned QR clues until they had taken their guest to all five stations. Once completed they found me, returned their iPad and I gave them a 3 stars and a wish form to fill out with their parents and with my support if required. 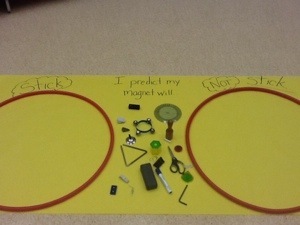 The science station was an example of a typical grade one activity where we might make and test predictions. At the fitness stations students demonstrated some of the yoga poses and exercises we practice as part of our daily physical activity. The final station was a student choice activity. The day before the conference students were invited to choose what they would like to share. 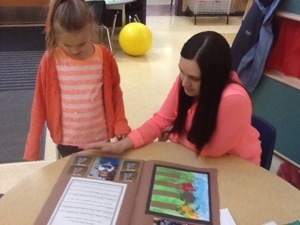 Most students wanted to share their scrapbooks and poems duo tangs. 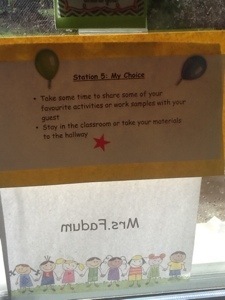 As part of this stations students invited their parents into our classroom. Yes I had parents floating in and out of the classroom all day while students went about their learning. It was not as distracting as one might think, the student leading a conference would simply walk their guest around and show them our classroom. Everyone else went about their business as usual. This was a great way for me to see how articulate some of my shy students can be when they are surrounded by the comfort of family. A favourite moment was watching one girl have her parents sits criss cross at the carpet at she rang our chime and taught them about mindful breathing. It was very interesting to see what parts of the classroom or activities students were excited to share. 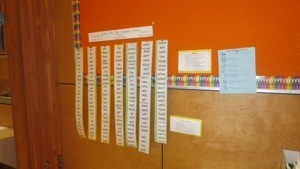 At the math station I simply placed the various games we play at Math Centres and invited parents to play one with their child. It was incredibly informative for parents to see the value of dice and card games in building number sense. I connected with parents at this station to answer questions and ensure they understood their child’s understanding of the math concepts we were learning. 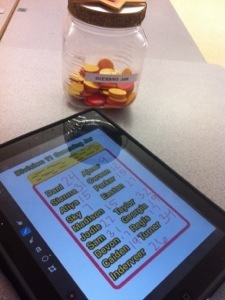 Students also shared various math apps and math projects on their iPads at this station. As Language Arts is so critical in grade one I included performance standards and other points of reference for parents at this station. I think that as teachers we often forget that most parents really don’t know what it looks like to be reading or writing at grade level expectations. 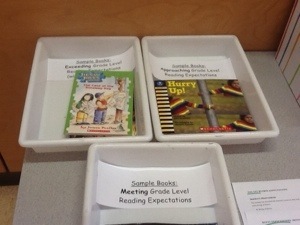 The feedback I received from parents was very positive and the opportunity to compare their child’s reading level and writing abilities was much appreciated. more informed than with the traditional report card. This process was informative for me as well as I observed students with their guests. 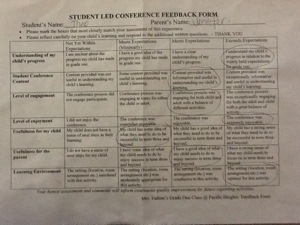 When I sent report cards home I did not fill out the comment box but simply referred to the student-led conference. I did attach the prescribed learning outcomes as I honestly did not have time to adjust them this term. In the next term I intend to look at an alternative to the exhaustive list of PLO’s. 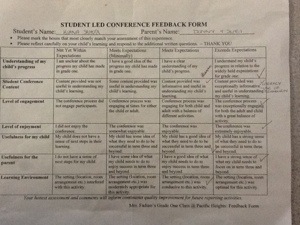 Many of my parents have thanked me for the experience and were very happy to have student-led conferences in lieu of a comment box. All I know is that this was my first attempt at something new and I am very pleased with the result. The only problem I have now is I don’t know if I can go back to the old way of reporting. 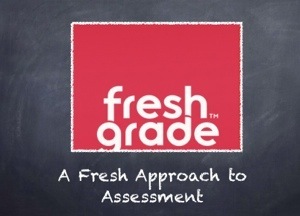 There are so many ways to make assessment meaningful, to involve parents and to engage students in their learning journey, I am excited for the possibilities. QR is short for Quick Response. A QR code is a digital image that can be scanned, much like barcodes. Once scanned with a smartphone or mobile device the code will direct your device to a website or reveal a text or voice message. 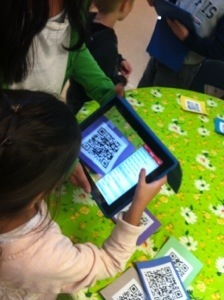 I have been using QR codes in my grade one classroom for the last year and have loved the experience! The possibilities are endless! 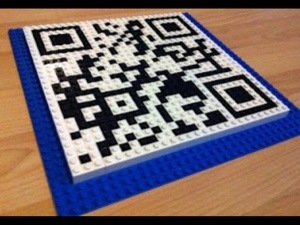 In some situations the QR codes simply increase student engagement or just make a lesson more fun. Although I am always looking for new and meaningful ways to incorporate technology in my classroom, I am not sure when it became a negative to get kids excited about learning. While it is true that we can have our students participate in a scavenger hunt with written or picture clues or simply give them a web address to type in and get them to a specific website why not make it more fun with QR codes? They truly are simple to make and kids love scanning them. QR codes have many other uses as well, many that are really opening new doors and giving students, parents and teaching a whole new experience. So what tools will you need to get started using QR codes? Here are a few of the ways I am currently using QR codes in my classroom. I have many other ideas and hope to learn about even more as I know there are some fantastic ones out there! One of my favorite uses of QR codes is to give my students access to the many photos I take with my iPhone or iPad. 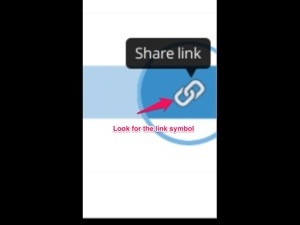 Once photos have been uploaded to an online site such as Dropbox you can make a QR code from the link. Students then scan the code and can save the photos to their own device. 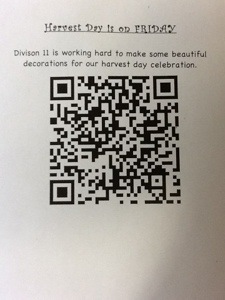 I leave QR codes from field trips and various activities up on a wall and students use them for various things such as making books or writing journal entries on an iPad. Asking primary students to type in a long URL is very time consuming and can be exhausting for the teacher as we rush around trying to help those who missed a letter or added an extra space. If you have a website such as Canadian Geographic Kids that you would like all your students to go to, simply copy the web address in a QR generator. 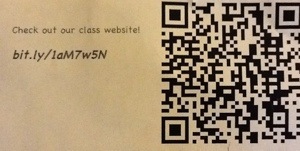 You can do this on a computer and print a QR code for students to scan. If you have a projector you can make the QR code on an iPad and students can scan it directly from the screen. If you have a school or class website, blogs or any site that your parents visit posting a QR code in the window or sending home a copy of a QR code makes it easy for parents to access sites. QR codes can be scanned with any smartphone or mobile device. A fun way to give your parents a sneak peak into your classroom is to record an activity such as shared reading or painting, upload it to an online site then create a QR code with the link. Parents can scan the code and have a look at their child during a school activity. A QR code scavenger hunt is a great ice breaker activity with big buddies and a fun way to help younger students explore their school. I challenge students to take pictures of certain things with their iPad. I create QR codes to reveal clues such as ” this is where we go to read books” and have students take a picture of the library. These pictures can be used for various writing activities later on. All students love this activity. It is a great way for buddies to get to know each other and their school. 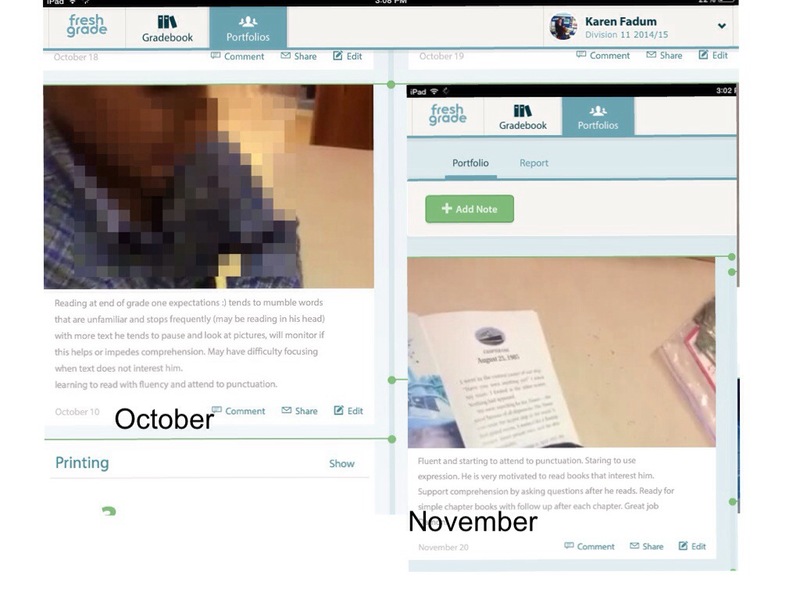 There are a few ways to create a QR code that will reveal a recorded video or message. If you use an app like Audioboo or a site such as Croak it you can copy the link into a QR generator. If you record a message using your camera you need to upload it to a site such as Dropbox and get the link from that site. You can also use an app like QR voice to type a message and create a synthesized voice message. 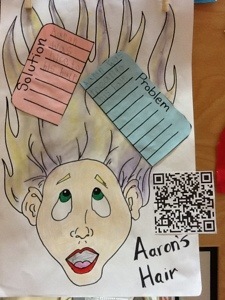 After reading Aaron’s Hair by Robert Munsch I recorded a short video of students describing their work, uploaded it to Dropbox and created a QR code to the link. The QR codes are attached to their work in the hallway and can be scanned by parents, visitors and other students to reveal their video. If you have something such as pictures and you want to create a QR code, open Dropbox and upload pictures. Open the file on Dropbox, copy link to clipboard and the paste in QR Creator. 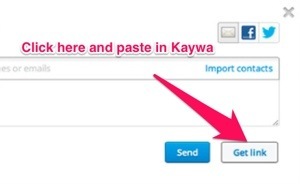 There are many QR generating sites but I prefer Kaywa. It is a free site with options to upgrade so you can save your codes. If you want to link to an online source you need to copy the link, paste it in the space provided and click on generate. If you have trouble printing try clicking permalink and print from there. If you want to type a message click on the text option, type your message and click generate. 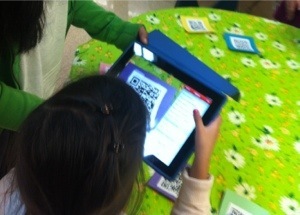 I would love to hear how you are using QR codes in your classroom. Happy scanning! 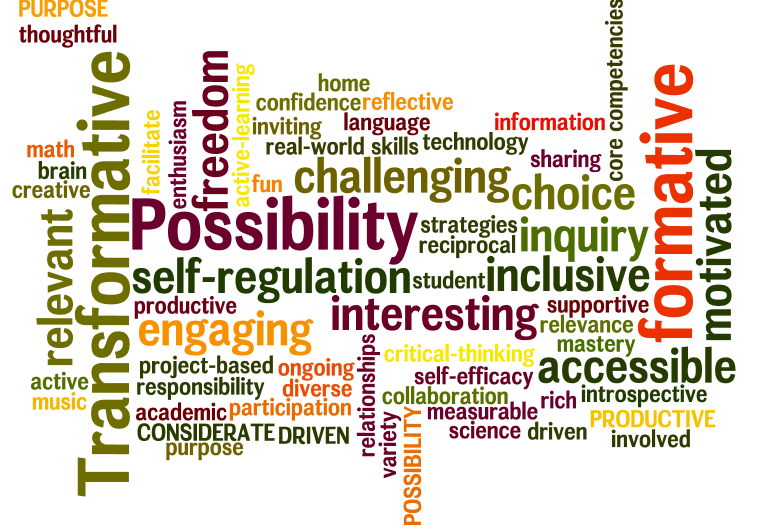 iPad in the Primary Classroom – Go for it! I feel very fortunate to be teaching at technology rich school. In my grade one classroom I have a document camera, projector, apple tv, teacher iPad and access to a class set of iPads several times a week. Although technology is not an area that I have ever been particularly fond of or knowledgable in, it has become an integral part of my teaching over the last two years. I have found the iPads in particular to be a very useful tool. I value differentiated instruction. Having students that are engaged and active participants in their own learning is important to me. I cringe at the thought of teaching a lesson that will frustrate some, bore others and hopefully meet the needs of at least some of my students. Handing out the same math questions or reading response to 24 individual people and expecting it to be meaningful to everyone is just not realistic. That being said there are only so many hours in the day and as a working mom I have always struggled to find the time to meet the individual learning needs of all my students, all the time. 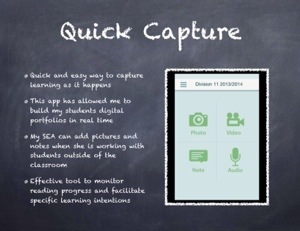 This is what sparked my passion for integrating technology into classroom learning. I embraced the iPad as a tool and have found it allows me to provide each learner with activities suited to their learning needs. It also allows me to do my job more efficiently. I find myself spending less time creating and managing activities and more time with my students. When the Surrey Primary Teachers Association asked me to host a workshop dedicated to the use of iPads in a primary classroom I was quite surprised. I really did not consider that some teachers had access to iPads and were not using them. I was curious to know what teachers would be hoping to gain from an afternoon at my school so I sent the participants some questions using Survey Monkey. The results are very interesting. Teachers who are obviously passionate about their craft (since they have registered for an after school workshop) are not using all the available tools to enhance their lessons. Technology is such a new concept for so many people and it seems like people worry they do not have enough baseline knowledge to bring it into their classrooms. 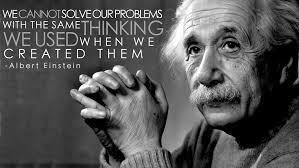 I honestly believe that teachers wanting to explore iPads need to make a shift in their thinking. As teachers, we do not need to know everything about iPads. You can bring them into your classroom knowing very little, as I did. Our role is to provide the learning environment and curricular goals, from there we can simply facilitate and learn with our students. Using technology such as an iPad is not a new ‘subject’ that we need to teach. It integrates nicely into all areas of the curriculum and serves to facilitate the learning process. It is quite a powerful experience to learn alongside a 5 or 6 year old. 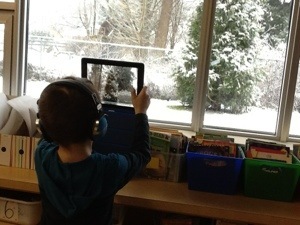 Just put an iPad in their hands, give them a few guidelines and watch as they explore, create and learn. If you are a teacher who has been hesitant to bring iPads into your classroom I really do encourage you to just take the plunge and go with the flow. For those who need a more structured approach here is a play by play of how I get iPads going in my grade one classroom and some of the things we do with them. ~ I bring iPads into my classroom during the first two weeks of school. ( We have a cart that holds 30 iPads and is shared between 13 classes. All teachers sign up for one 45 minute block per week and open blocks can then be reserved on a weekly basis.) At first, an adult will be responsible to take them out of or put them into the cart but I eventually pass this on to my students. Before I hand out iPads for the first time we meet as a class to talk about our experiences with iPads. 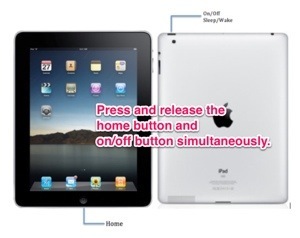 This year almost all of my students had used an iPad at least once and many had one at home. We talk about taking care to only touch the screen with the pad of one finger and other considerations such as no water bottles on desks with the iPads and carrying them with two hands. The only thing I talk to them about the first time is the home button and tell them they can touch it to get out of an app. Other than that for the first couple of times we use the iPads it is all about exploring and sharing. Allowing the students to explore on their own gives me time to assess their comfort level and knowledge of the technology. ~ One of the first things I introduce to my class is the camera. They love taking pictures with the iPad and once we get into creative apps knowing how to take and edit pictures is very useful. When I do have something specific to demonstrate I do so before students get their iPads and use my iPad connected to my projector (this is now a breeze with apple tv). The iPad cover can sometimes make it difficult for kids to take a picture so I show them how to fold it up and hold it or advise them to ask a friend to take the picture as they hold up the iPad. I take a picture with my iPad and then show them where the edit button is. I show them where the rotate and crop buttons are and then give them time to take a few pictures and practice editing them. We also learn how to take a screen shot. I find the iPad keyboard to be very user friendly and students need minimal directions before they feel capable to type on their own. 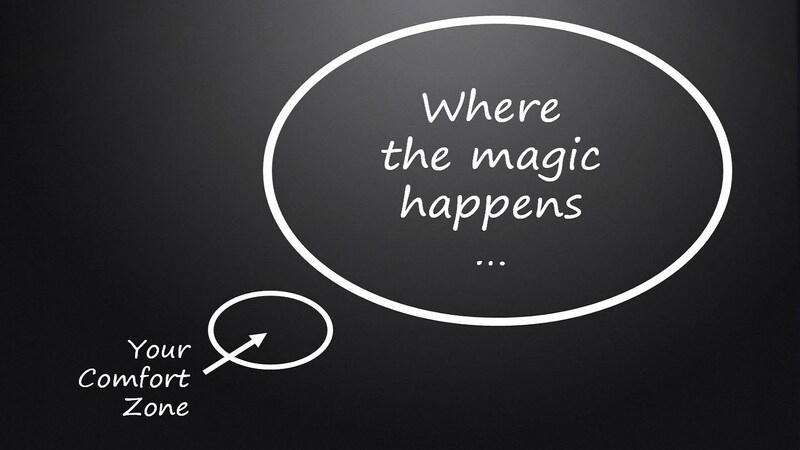 For teachers sitting on the fence and waiting to take the plunge with iPads in their primary classroom – just go for it! 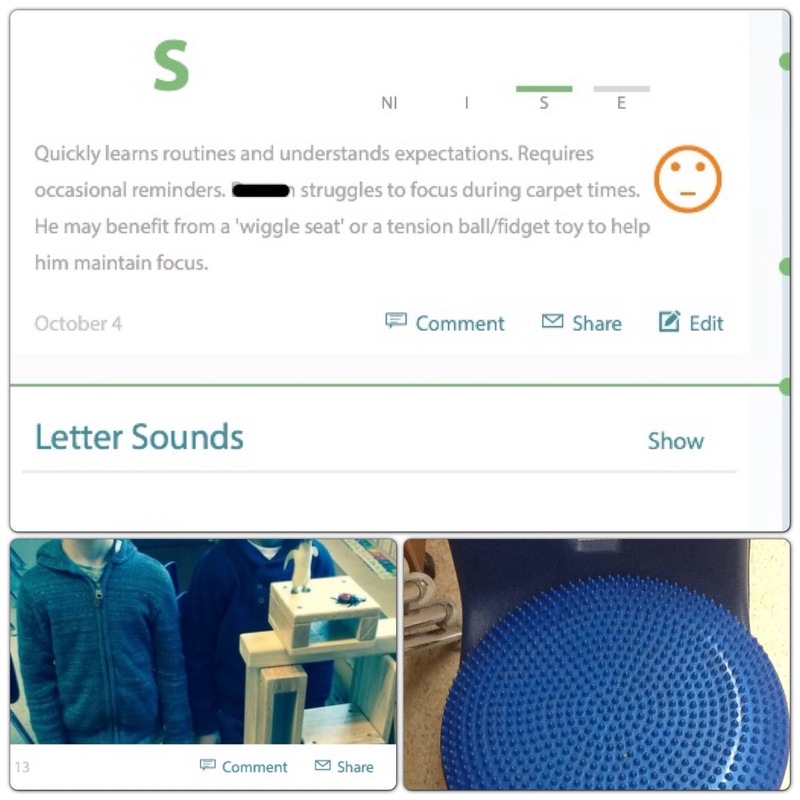 I believe you will be pleasantly surprised by how much you will learn with your students and what this wonderful tool can bring to your classroom.